Casper Sheets Review - Good Fit For You? 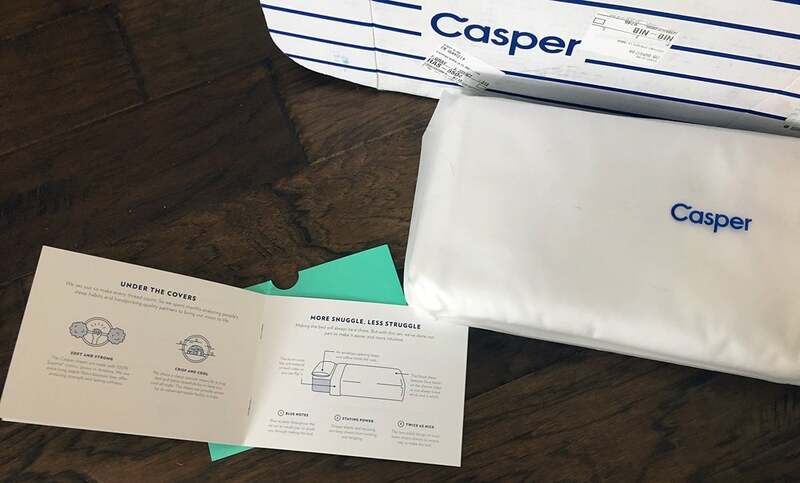 Home » Casper Sheets Review – Good Fit For You? 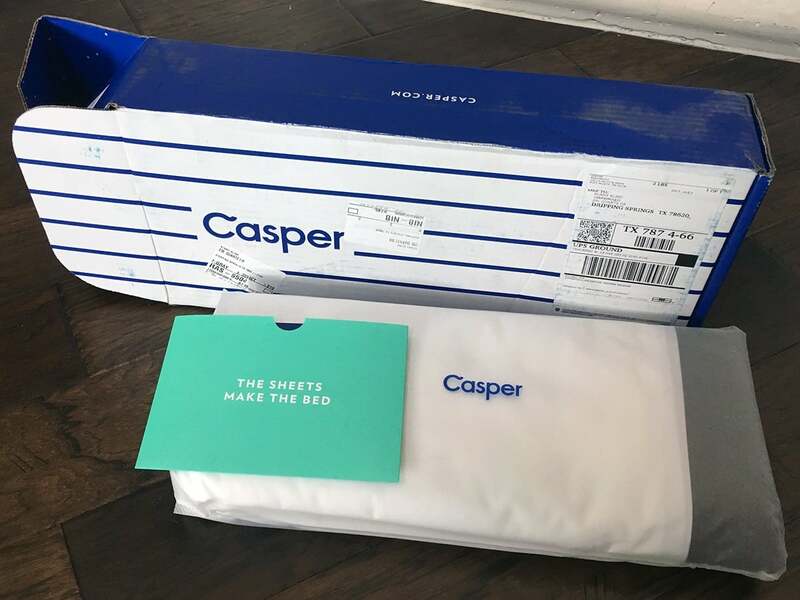 Casper Sheets Review – Good Fit For You? Casper’s sheets are as aesthetically pleasing as their mattresses, clean, simple and modern. The percale weave of these Supima cotton sheets gives them feel as that resembles a high-end hotel bed. If cool, clean and crisp are the ideal characteristics for your bed, the Casper sheets might be the best option for you. Worth the price? Read on for my full review. The sheets are made from Casper, a mattress/bedding company that was one of the first to start selling memory foam mattresses direct to customers online. Casper now offers other bedding products in addition to a mattress, including sheets, pillows, and a duvet. Supima cotton is a type of cotton that produces a very soft weave. The sheets are also called Pima cotton sheets and labeled “Supima” because it is a trademark of the Supima Association that promotes Pima cotton. Pima cotton fibers are 35 percent longer and 45 percent stronger than regular cotton fibers, according to Casper’s website. 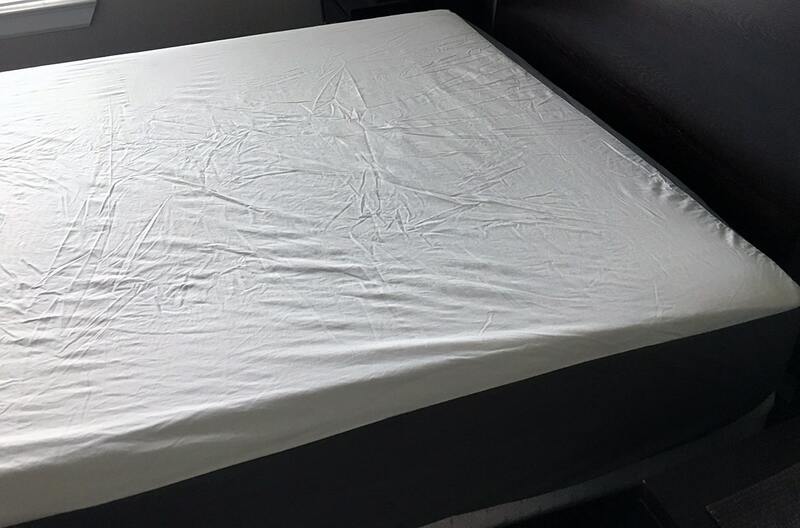 This makes them incredibly durable and Casper says their sheets won’t pill or wear thin. While the Pima cotton is grown in California, it’s sent to India to be for weaving and finishing. Wash in cold water on a gentle cycle. Tumble dry low, and remove from the dryer as soon as possible to keep from wrinkling. To keep your sheets their whitest, use a non-chlorine, oxygen bleach (that’s color safe with chambray!) with each wash. It’s best to wash your sheets every one to two weeks. You should also plan to wash and dry your sheets at least once before putting them on your bed. According to Casper: we purposely made our sheets on the bigger side in order to account for a two percent shrink factor that is industry standard. Giving them a quick wash will ensure the best fit on your bed, but they’ll be safe to sleep on if you choose not to. You can iron your sheets. I received my Queen size White/Chambray Casper sheets in nice packaging that was consistent with how they delivered my mattress and pillows. The sheets were folded impeccably and there was an envelope with information at the front of the package. I pulled out the sheets and followed the care instructions, washing them in cold water on a delicate cycle and a low tumble dry. 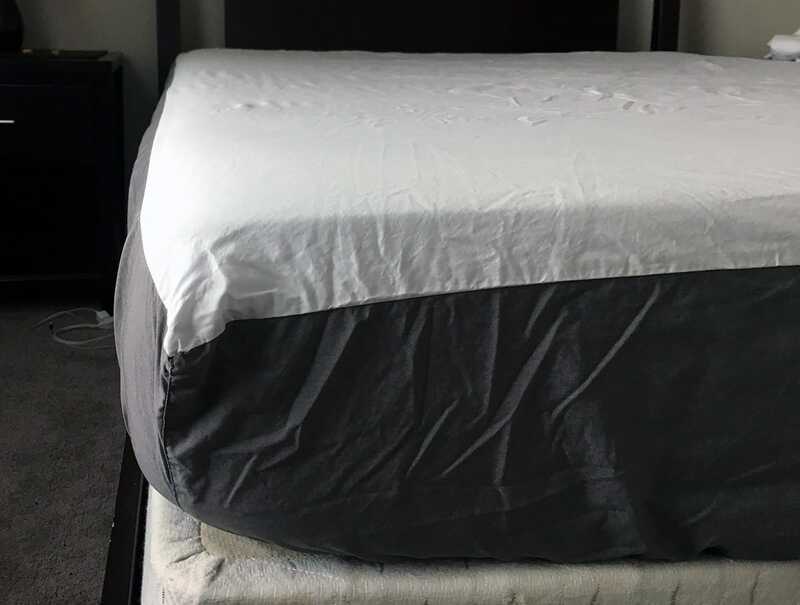 The sheets looked great coming out of the dryer and I noticed how thick the elasticized rubber grip was around the fitted sheet. I reviewed the sheets on my Casper mattress, although they can fit any mattress up to 14” thick. The sheets went on pretty well, but did not fit 100 percent perfectly like I hoped. I figured the strong grip on the fitted sheet would hold the sheet super tight to the mattress. It did a decent job but there was still a little gapping in places. 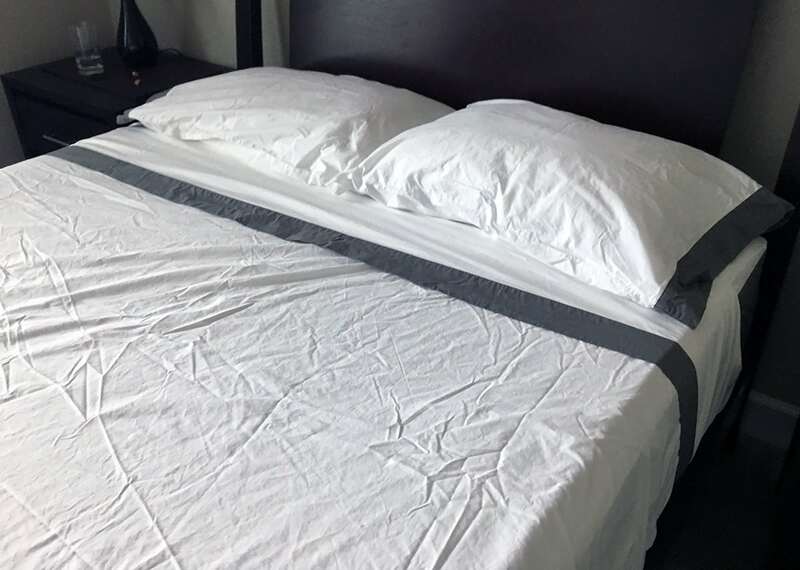 Since I wasn’t able to take the sheets straight out of the dryer and make the bed – and I don’t have the time or energy to iron my bed sheets – they were definitely wrinkled on my bed. If you make the bed directly after drying the sheets you should be able to minimize the wrinkles. The percale weave of these sheets gives them a crazy crisp feeling. If you have ever slept in a nice hotel you know exactly what I mean about that feeling. The clean white sheets feel great and new and luxurious but they do not have that lightweight, worn in feeling that you would get from a set of Brentwood Home’s organic Sonoma cotton sheets or the super softness of bamboo sheets. I slept well with the fitted sheet, flat sheets, and pillowcases. They were breathable and I experienced no wear. These Supima cotton sheets do not come cheap. They retail for around $140 for a Queen set, which comes with a fitted sheet, flat sheet, and two pillowcases. While they may be an investment, the unique 400 two-ply thread count (basically two layers of 200 thread count) Supima cotton sheets feel like high-end high-quality hotel sheets. You will wake up each morning with that crisp feeling that can be hard to beat. If those are the type of sheets that make you happy, Casper’s sheets could be a perfect fit for you. All Casper products come with a 100 Night Trial offer, which means you can see if they are a good fit for you and return them if they don’t meet your expectations. I was disappointed to see Consumer Reports give these sheets a very low review (1/2019). They scored well in all categories except “fit” and this drastically affected the final score. I have had these sheets for about 9 months and they are, by FAR, the best sheets I have ever owned. Soft, yet crisp. Cool in the summer, comfortable and breathable in the winter. They fit my 14″ mattress fine with room to spare. No, they do not have a super-snug bottom sheet but at least they are not a struggle to get on the mattress. Additionally they stay put extremely well due to the full-circumference rubberize elastic band. Both my husband and I love them and I am so glad I bought two sets so I don’t have to use any other sheets between washings.